Class A Advanced Lakeland lost two of its major offensive contributors recently, but A.J. Simcox and his teammates are showing that they can still hold their own. "Guys are just stepping up and making the most of their opportunities," Simcox said. "We've got a couple of guys that are swinging it really well lately and stepping up. It just seems like a different guy every night is having a big game." Simcox was that player Wednesday. Detroit's No. 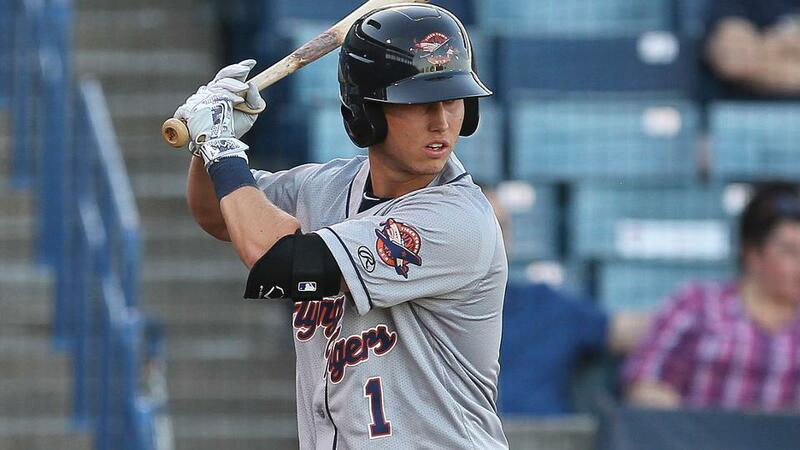 19 prospect collected a season-high four hits while scoring three times to help the Flying Tigers top the Brevard County Manatees, 14-6, at Space Coast Stadium. Lakeland set a season high in hits with 18 and tied one in runs a day after its parent club traded catcher Kade Scivicque to the Braves as part of a deal for shortstop Erick Aybar. Scivicque slashed .282/.325/.380 with six home runs and 41 RBIs with Lakeland. A little over a week ago, the third-ranked Tigers prospect Christin Stewart -- also a teammate of Simcox's at the University of Tennessee -- was promoted to Double-A Erie. Stewart belted 23 home runs and plated 67 runs prior to his Aug. 9 promotion. But the Flying Tigers have rolled on with a 6-3 record since Stewart departed. They've scored at least eight runs in four of those wins. On Wednesday, Lakeland took advantage of command struggles for Milwaukee's No. 13 prospect Kodi Medeiros by scoring four runs and chased the 20-year-old southpaw from the game after just one out. Simcox drew one of Medeiros' four walks. "He was making some good pitches, but we were just fouling them off and working counts," Simcox said. "I thought we had a pretty good approach toward him and a lot of guys had some good at-bats. They drew their walks, had a couple of guys that squared some balls up and we just took advantage of the opportunities that were given." The next inning, the 22-year-old shortstop collected an RBI double to left off reliever Clint Terry, then lined a single to center off the southpaw in the following frame. Simcox struck out in the fifth against Bubba Derby. But he came back with a single up the middle to lead off the seventh against the right-hander. He finished his night with a single to left off righty Jon Olczak in the eighth. "For the most parts, I stayed with my same approach," Simcox said. "I tried to be patient, get a pitch that I can drive. Later in the game, I kind of realized how they were pitching me a little bit, so I tried to focus on that a little bit more and be more aggressive. I just tried to see the ball and stay behind it and just slow everything down at the plate, I think it benefited me a little bit." It was Simcox's first four-hit game since Sept. 7, 2015 with Class A West Michigan. He also racked up four knocks last Aug. 24 against South Bend. The 2015 14th-round pick has hit safely in five straight games and 10 of his previous 11. "I went back to my routine that I used in West Michigan," he said. "It got me in a comfortable position with my swing and it got me that feeling back. ... I did that a little bit earlier in the year and it had been working, but just playing every single day, I started to lose feeling of it. So I went away with it and tried some other things. Then I lost feeling with that, so I went back to see what I've been doing and tried to focus on it before the game, carry it over to batting practice and then carry it over to the game." Ben Verlander, who went 4-for-4 with four doubles Tuesday, went 3-for-5 with three RBIs. "It's always a good feeling when your whole team is swinging the bat well," Simcox said. "It makes it easier on our pitching staff to go out and pitch with a lead. You always want to see your guys on the team succeed, and it's a lot better clubhouse when everyone is playing well and everyone is happy. It's just makes baseball a little easier and a little more fun." Righty A.J. Ladwig (10-9) hit double-digits in the win column. He gave up four runs on seven hits over seven innings. He struck out four and didn't issue a walk.